My last long-form blog generated some great conversation over on LinkedIn (see that here). One gentleman in particular, Art Jones, really laid out what i consider to be some meaningful goals for the environmental community, at least in concept. Let's call it The 5% Campaign and see where it goes. Are you part of America's 5% Minority? Art says he's considering blogging, and has some papers drafted, "My goal, use our voice and (economic) power. Use what we are not fully engaging today. Overcome our own tendency toward status quo... waiting for governments, corporations and the "other" guy." Sounds familiar and simple, but read on. .reduced job commuting by 20% (one day a week, or one week a month). .stopped using electric and gas clothes dryers. .reduced their shower/baths by 1 per week. .kept their car 2 years longer. .bought computer and smart phone gear just a little less frequently. .All the Sierra Club, Audubon, Green Peace, Earth Hour (and etc) folks? 1% drop in consumer oil consumption. 2-3% drop in water consumption. 1-2% drop in electric usage. How long have we voted and waited, voted and waited, voted and waited? It starts with adding the economic vote. It starts with a friendly gesture not hostile to would be allies. It starts by a core group being ans example, a witness. OK. Off my soap box." I love this idea. OK, maybe the commuting thing won't work for a lot of people. Likewise, with the clothes dryer. But -- what can we ALL we do; the 5% of Americans who really care? 5% of the American population is 15.6 million people. That's enough to matter to the media, to big business (as Art suggests elsewhere), and to our politicians. health nuts & outdoors enthusiasts. But my goals, compared to Art's, have been all about the unification itself, and doing so so that we might declare our priorities and quantify our values to the American media... Good luck, right... Art's got something YOU can DO, that collectively would make an impact. Are you concerned about the environment? 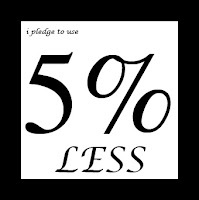 If so how about offering your ideas for reducing daily consumption by 5% (in "comments" below). Maybe we've got something here: the cross-unification of the environmentally minded in order to reduce consumption impacts on the environment, a little bit at a time, all under one large campaign banner. Lord knows, we got problems. If 5 people comment that they think this is a good idea i'll put more thought into taking this further. What would be meaningful, actionable, easy to maintain, and easy to sign onto? I've got a few ideas. Let me know yours. More of Art's comments here. (Good stuff.) One good one, "I do not advocate a single bunk with a raw food diet without travel, entertainment or computer. I have my comfort too by which my prescribe my needs and claim a quality of life. A modest reduction per person done 30 million times impacts the corporation significantly. Can the Democrats muster 20% of its group to change? Can the environmental community commit to a lifestyle change from its contributors?" Here's hoping my new friend Art Jones starts blogging soon. Just reading your post and references to Art's comments. Followed the link trail... Have you seen The Basics of Oil Pricing and the Effect on the Price of GasIt's a blog post by Craig A. Ruark. Very interesting. That is to say, that drilling more oil in the US is not a solution. Reducing oil consumption is. Why? Because cheap oil in the short run will only increase demand and accelerate the environmental impact. Like giving whiskey to an alcoholic. Worse yet, oil drilled in the US or Canada and piped through the US, will not necessarily be SOLD in the US. So now we're subsidizing companies that profit on weakening our economy AND destroying our surface environment because we're addicted to a poison, distilled substance. Ms. Wylde - thanks. Your 2nd comment illuminates exactly where we're heading. The US Gulf Coast is in mega boom, on its way to becoming the world's oil/gas refinery super center -- with greater total refining capacity than that of Saudi Arabia. Scary. And yes as you say the impacts of continuing to grow our fossil fuel dependency for transportation fuels on our health and environment, are pretty well forecast and understood.